Bubby Makes Three: DIY Mobiles for Nurseries... Parties... Events... Cubbies? DIY Mobiles for Nurseries... Parties... Events... Cubbies? I love tissue paper pom poms. I do. Doesn't everyone? Am I am sentimental toward them, having made a bunch for my baby shower a million years ago and many an event thereafter... but the idea is getting a bit - well - old, don't you think? So, I was excited to discover this alternative today! It's a colourful paper mobile constructed from little more than some strips of paper and a line of sewing thread! I love that this mobile would look equally gorgeous in a babies nursery; hanging over a party table; strung from a tree or... I'm thinking, hung in a kids cubby house! And wouldn't it be sweet to make a bunch of these for a baby shower and use it afterward in the nursery? You could of course go all sophisticated and simply use blacks, whites and greys which would be a totally different - but still lovely - look, but I can't go past all that lovely colour! 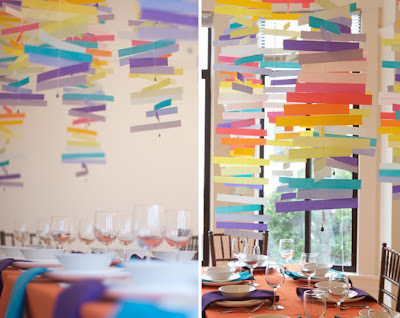 The instructions for making these colourful mobiles can be found here. Enjoy - I'll be sure to share if I make some for the cubby!